"...proud moment for the people of this province"
"the first time in the history of this province that we finally have a leader who..."
Finally signing the Nunatsiavut government self-government agreement. However, I can't take credit for that, 'coz a lot of that work, most of that work, was done by predecessors, and I just happened to be the right person in the right place at the right time. He can't take credit for it, but he won't let that stop him. Just like ODP has been balancing the budget with the billions coming in from all those "giveaways" that "predecessors" did all of the work on — including the signature piece. Cheers: to saving paper - and making records disappear. Or should this be a jeer? One of the things to come out of the Cameron inquiry is the strange situation that the senior level of this province is not only paper-less, it seems to be message-less. The premier's chief of staff testified he prefers to do things in person or by telephone, rather than sending e-mails or written messages. The premier himself says he's not much for using the e-mail system, either. And we've been noticing a disturbing trend when we use Access to Information legislation to get briefing notes for new cabinet ministers - some departments now insist they don't brief their ministers at all, and there are no records of them telling their ministers anything about their new responsibilities. Given something else that came up at the Cameron inquiry - the ability of so many of the premier's staff to not recall things - perhaps a paper trail wouldn't be a bad thing to have after all. In all fairness to ODP, dear Telegram, nothing could be further from the truth. He's not entirely averse to using email. Jason from Mount Pearl, NL writes: WOW! Yes, he is a wealthy man, but this guy does not get paid to run the province, instead it is donated to charity. Why would someone put them selves in the public eye to be heckled for free is beyond me....thats honorable if you ask me. Tim from NL writes: In 2009 I think everyone should start posting only positive comments, if you have something negative to say keep it to your self. There is enough negativity surrounding us, we don't need to be bad mouthing each other. This should be the year that all the people in Newfoundland & Labrador work together. Happy New Year to all! After the Oct. 14 federal election, Williams buried the hatchet with the federal Conservatives and Prime Minister Stephen Harper. But during the election, Williams launched his Anything But Conservative campaign. "It was an opportunity for the federal government to right the wrong of the Upper Churchill, whereby we are losing, like, a billion and a half dollars a year." But Williams maintains the feud is over now, and says he hopes for co-operation from Ottawa on funding a new penitentiary, a federal ocean agency, the Lower Churchill project and transmission line. ABC was about redress for the Upper Churchill? That's an interesting revision to very recent history, one that could easily be refuted by looking at newspaper articles from two months ago, and one that makes no mathematical (or any other kind of) sense: if the "loss" to the province is a billion and a half dollars a year, a magical HappyMoney payment of $10-billion "right" less than five years' worth of that "loss"? But above all, if Williams now "hopes" — he's always hoping for something that he ought to be working for — "hopes" for Ottawa's help to fund the so-called Lower Churchill project and a transmission line (to where? ), can it really be said that We Are Going It Alone? When was the last time a piece of legislation "accomplished" itself? Autonomy means, in part, taking responsibility for your own actions. Williams said reaching the tentative New Dawn agreement with the Labrador Innu in September brings the province one step closer to making the project a reality. MR. KELLY: Agreement with the Innu means the Lower Churchill development is in full steam ahead with lots of momentum, Mr. Speaker. 2009, 2010, it could be a year either way... if it's going to happen, it'll happen. Newfoundland and Labrador Hydro already developed, on My Government’s behalf, a comprehensive Lower Churchill project execution plan to achieve a project sanction date by 2009 and first power by 2015. "Project sanction" will, for a variety of reasons, be delayed until the next election year. And the project so sanctioned will still not get built. "three times the size of Prince Edward Island!" OK, not to whoever at CBC decided that a Céline Dion biopic was a good idea. "Our government recognizes the important role our public sector employees play in our province and I am pleased that we were able to successfully reach an agreement with NAPE that will see its members receive a significant salary increase and one which they truly deserve... On behalf of Premier Williams, I would like to thank NAPE President Carol Furlong and her negotiating team for their professionalism throughout the bargaining process," said Minister Kennedy. Perhaps it’s time to reopen the Legislative Council. Bring it on! Term 14(2), baby! Premier Roger Grimes has characterized his government’s new access to information legislation as leading-edge — a hallmark of his open and transparent administration. Williams said he’s disappointed in the legislation, which, according to his interpretation, contains a clause that gives cabinet the power to create exemptions by adjusting the schedules of what is covered by the act. "I think sometimes people can stay in power too long and start to think their [sic] infallible and (they) can't make any mistakes and get caught up in they're own importance," he said. "I don't ever want to see that happen to me." This corner has seen the light, and will beg forgiveness. As Our Dear Premier might say, in the passive voice, on a go-forward basis, all negativity is retracted. Perhaps Mr. Williams' hard negotiating style (which is one of the many reasons we now enjoy surpluses while Ontario is sucking the federal teat, I might add) isn't liked by my mainland friends, but that's the way he operates. Behold! the awesome awesomosity that is Danny Williams! Behold! his power to travel through time! The province is enjoying surpluses thanks to the considerable direct royalty revenues coming in during the past few years from the three offshore oil projects (Hibernia, Terra Nova, and White Rose), and three major mines (IOC, Wabush, Voisey's Bay) and the indirect taxes on income and production associated with those operations. All of those projects' royalty regimes were set by previous governments. But, as Darie notes, it is Danny Williams' negotiating skills which are responsible for the surpluses, which can only mean one thing: that He travelled backwards in time, to decades from the 1930s through to the 1990s, and negotiated those deals. He must also be responsible, per Darie, for the run-up in commodity prices during the middle part of this decade. Oh, His power is a terrible thing to behold! Mine eyes! Here, then is truly a Great Leader, taking his mantra of "no more giveaways" to the extreme. Not content with merely infringing the common law, the statute law, the constitutional law, or the law of international trade; if necessary, Our Dear Premier will dictate the law of supply and demand, and break the laws of physics, all for the welfare of His people. Do we doubt Him? Do we dare doubt Him? "We have a tremendous wealth of energy resources in Newfoundland and Labrador and Nalcor Energy will enhance the value of the people’s assets, while growing an internationally-competitive corporation that will be a flagship for the province," said Premier Williams. "No longer are we passive players in the development of our resources; rather we are now fully engaged partners, sitting at the table and actively involved in resource development for the benefit of our people. Nalcor Energy will represent the people of the province in developing and managing our energy developments, and we look forward to a bright future for this new provincial corporation." Rhetorical retort to Bartlett's Familiar Quotations. Boy, that Jerome! Kennedy sure is getting a lot of press releases lately. Newfoundland and Labrador’s population has increased by 1,049 people from July to October 2008, representing the highest quarterly growth rate since 1991, according to Statistics Canada. The Honourable Jerome Kennedy, Minister of Finance and President of Treasury Board, said the province’s population has increased in four of the past five quarters. The province’s population was 508,944 as of October 1, 2008, representing an increase of 1,049 people (or 0.2 per cent) from the previous quarter. Net gains were recorded in both inter-provincial and international migrants. First: The highest quarterly growth rate since 1991? In other words, since the last major recession (or is it a depression? ), just as this corner speculated about this time last year. As much as this corner likes to be right, this is not a great thing to be right about. Second: Natural decline? Once again, old news in this neighbourhood. And it's about to get much worse, as the baby-boom population, both those who never left, and those who are retiring home, start dying off in larger numbers than they already are. Even if the Progressive Conservative Family Benefit changes the birth side of the natural population equation — which it won't, but that won't stop Danny Williams-Government from crediting his NeoBabyBonus for an already-happening levelling off in the rate of decline — the impending Decades of Death are going to make it impossible for the provincial population to reach Our Dear Population Target of a million people. Third: in-migration is not being driven by "confidence" or "our strong economic position". Has Jerome! been to the outports, mine towns, or mill towns lately? It is being driven in part by economic migrants who are returning home to friends and family after work and business opportunities in other provinces dried up, and in the other part by the declining incentives in other provinces. Other provinces are experiencing repulsive out-migration, while NL sees a decline in repulsion without any great increase in attraction. And, with mills shutting down, mines slowing down, imaginary projects like a refinery or the so-called Lower Churchill going nowhere fast, and a timetable for Hebron that no one believed on the day it was announced, let alone under the more recent economic circumstances, the construction workers who are coming home better hope that there'll be lots of work coming their way from the other thing driving in-migration: people who moved to other provinces from rural communities, spent a lifetime and a career, and are now returning "home" — to new construction, reno jobs, and, eventually, yet-to-be-built long-term care facilities in greater St. John's. [NDP leader Lorraine] Michael did have concerns over two other bills. One governs the province's research and development council and the other broadens the definition of what a cabinet document is. Cabinet documents are protected from access to information requests. [Liberal leader Yvonne] Jones said that bill was also contentious for the Liberals. She said documents her party gets from government are often heavily edited or come with a price tag. "Right now we have $6,000 in requests," said Jones. CLERK: An Act To Amend The Management Of Information Act. CHAIR: All those against, 'nay'. CHAIR: Shall I report the bill carried without amendment? Passed without amendments. Fair enough — they'd have been voted down by The Party anyway. But also passed without amendments even having been proposed. Passed with five voice votes during Committee of the Whole considering Bill 63, and not one voice responding to the Chair's, "All those against, 'nay'." Just as none responded to that call in the Second Reading vote. Or in the Third Reading vote. In the one or two hallways — or, more likely, broom closets — of academe that still care. In a very narrow circle of archivists, and possibly archival users. In one or two newsrooms, but no more than two. And in retrospect, to future generations of historians — and others who may have a particular interest in the paperwork of the Williams regime — extremely contentious. But in the political sphere? On three separate days, according to three issues of Hansard, the presiding officer called "All those against, 'nay'," and not once, not once, was a dissenting voice raised for the record. MR. KENNEDY: We have a government to run, Mr. Speaker. The Supreme Court of Canada, in a number of different decisions over the years, and other courts, have recognized the importance of Cabinet privilege, Cabinet secrecy. It is one of the principles upon which our system works. Deliberations have to be able to take place in an environment that allows for us to make the decisions needed without making them public. So, personally, although some of my - I am not saying that the Access to Information Act needs to be changed, but I would suggest that section 18 of the Access to Information Act is too vague. "The head of a public body shall refuse to disclose to an applicant information that would reveal the substance of deliberations of Cabinet, including advice, recommendations, policy considerations or draft legislation or regulations…". "I hate giving timelines for negotiation because sometimes they take on a life of their own..."
"While we cannot guarantee the 20 per cent wage offer will be on the table after December 31..."
It is quite possibly — like the Churchill Falls contract was for Smallwood, the nationalisation was for Moores, or the Upper Churchill Water Rights Reversion Act was for Peckford — the piece of legalese that will reverberate the longest from, and most define, the sorry, sorry episode that is the Danny Williams-Government years. Bill 75. An Act to Return to the Crown Certain Rights Relating to Timber and Water Use Vested in Abitibi-Consolidated and to Expropriate Assets and Lands Associated with the Generation of Electricity Enabled by those Water Use Rights. You can open the .pdf of the bill here. But what you can't do, thanks to the security settings on the file, is copy or paste any of its text. It's what the cool kids call "locked". Adobe Acrobat helpfully tells you, when you click on the little lock icon, that "You can print this document." [Phew!] But, "You cannot copy from this document." Danny Williams-Government's openness and accountability strikes again. Mitigating factor: at least none of the .pdf is blacked out. You'd think the free-marketeers over at Daimnation might have some public thoughts on Our Dear Expropriation Bill. "If it is any consolation, the Globe and Mail today nailed me for it, and that is a good thing, because if they are criticising it, we are definitely doing something right, there is no doubt about that." So says ODP in the House of Assembly. Outside the House of Assembly, he professes not to read the Globe and Mail, or care what it writes. MR. KELLY: Mr. Speaker, I am excited about the opportunity to participate in the management and growth of this Province. I am confident that the direction of our leader, Premier Williams, and his team, will result in long-term sustainable benefits for the people of Newfoundland and Labrador. MS POTTLE: On September 28 of this year this government, under the leadership of Premier Williams, laid out the framework of a wide-ranging agreement with the Innu of Labrador. In July, I had the opportunity to travel with Premier Williams to Conne River and partake in the 13th annual Miawpukek First Nation Powwow. The Miawpukek First Nation Powwow was recently recognized as one of twenty-nine significant Aboriginal tourism events by Aboriginal Tourism Canada. PREMIER WILLIAMS: A good question, Your Honour. Proceed with Joint Supply Ships contract in Marystown. Mr. Speaker, this government has been engaged with our federal counterparts. This is a number one priority, the Trans-Labrador Highway, for the Department of Transportation and Works and for the Government of Newfoundland and Labrador. I am happy to report here today, Mr. Speaker, that we are in discussions with the federal government. We have had a number of meetings, and I can say with all confidence today, Mr. Speaker, that at the end of the day here, we will see the hard surfacing of the Trans-Labrador Highway start as early as next June. I am very pleased to do that, Mr. Speaker. Why is the TLH no longer "a number one priority"? 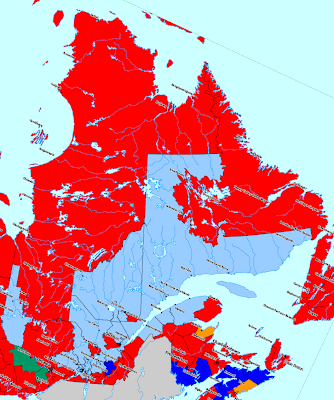 And what in purple blazes does it mean to "Designate Newfoundland and Labrador as the Northern Gateway"? From the memor hole. Emphasis added. ST. JOHN'S, June 2, 2000 — Opposition Health critic Loyola Sullivan says the province's health care corporations are not above the law. The Opposition, through Sullivan, sent eight Freedom of Information requests on February 2 to health care corporations throughout Newfoundland and Labrador. The Opposition has been attempting to find out the total number of lawsuits against health care corporations and the amount of settlements to date. Sullivan said only three of eight corporations responded to the Freedom of Information request. The remaining five corporations are in violation of the Freedom of Information Act by failing to respond within the required 30 days. Only the Western, Central-West and Avalon health care corporations responded. The Peninsulas, Grenfell, Labrador, Central-East and St. John's health care corporations did not provide any information requested through the Freedom of Information process. "The Peninsulas Health Care Corporation reports that it cannot provide the information requested because the lawsuits were made through liability insurance and the information is confidential," Sullivan said. "This is utterly ridiculous, considering the people of this province fund the operations of health care boards and hospitals. This is not accountability for taxpayers' money. No government agency or institution should be free to escape accountability." Sullivan said he also has major problems with the Health Care Corporation of St. John's for failing to respond to the Opposition's Freedom of Information request on lawsuits and total costs. "A corporation official contacted the Opposition office April 7 to explain that their CEO, Elizabeth Davis, would be returning from vacation April 14 and apologized for the delay," he said. "Despite promising to comply with the Freedom of Information request, the corporation has yet to respond. Where is the accountability within the system? Why are Crown corporations, agencies and institutions allowed to break the law by ignoring the Freedom of Information Act?" "I can only imagine someone is trying to cover up information. The public has a right to know how their tax dollar is being spent." Sullivan is calling on the Minister of Health to ensure there's accountability within the health care system and that the health care corporations – appointed by the government – obey the laws of the province. Outside the House of Assembly, Premier Danny Williams told reporters he doesn't foresee a lengthy court battle with Abitibi. "I don't think there's going to be a court battle. If they get good legal opinions, those legal opinions are going to tell them this legislature has a right to do this," said Williams. "The legislature is paramount," he said. "I can't, obviously, pre-empt the right of any judge to pass a decision on any application that's put before him or her." But We can post-empt to Our Dear Heart's content, We being such a Great Lawyer™ and all. Comments: long overdue, now do the same with churchill falls, just turn off the power and quebec will wake up. Canada, newfoundland & labrador will be (and always would have been) much better on our own. There are numerous charters and licensing agreements which allow Abitibi to operate in this province and those relevant to the natural resources of Newfoundland and Labrador will be repatriated to the province. The government is not in the business of making paper... that's the role for the corporate community. Government is not in the business of making paper. Which makes a body wonder: how does government decide which businesses it is in? ... yet callers can get on and discuss medical and legal matters — especially family law ones — from here to signoff? Hands up, anyone else who finds this unseemly. "Our government recognizes the valuable contribution that all of our public employees make to our province, including our health care professionals," said Minister Kennedy. "...On behalf of Premier Williams and the Government of Newfoundland and Labrador, I would like to thank AAHP president Patti O’Keefe and the AAHP negotiating teams for their professionalism throughout the bargaining process." "On behalf of Premier Williams and the Government of Newfoundland and Labrador, I am pleased that we have reached a tentative agreement with our province’s teachers that recognizes the important role they play, and I would like to thank NLTA president Sean Noah and the NLTA negotiating teams for their professionalism throughout the bargaining process." Curiouser still: Mr. Executive Council used to always appoint Himself Grand Marshall of these Labour Peace In Our Time announcements. The inevitible intertubes response to yesterday's hilarious breach of Presidential security. Nothing makes reporters see red quite as quickly as when they are told something convenient just to make them go away, especially when they know otherwise. They follow up on things, especially when answers make no sense. A premier of this province once said he had a report that proved the Sprung technology worked, and he would be happy to show it to everyone - except that it contained proprietary information and that meant it couldn't be released. Turns out, the report didn't say that at all. Most interesting, interestingissimo. you might say, because that is exactly the same excuse that is being used, twenty years later, to avoid releasing the study into the use of "cheap seal" on the Trans-Labrador Highway. Where's the opposition on all this accountability, secrecy, and intimidation stuff, anyway? Kelvin? Yvonne? Um, other guy? I’m not one who goes with urban myths… or unfounded, kinda, off-the-wall accusations. - Radio Host No Names Please, Friday afternoon. In taking questions from reporters, Williams said that neither the Lower Churchill project nor the Hebron offshore oil development were threatened by the current recession. "I have absolutely no concern," Williams said. "Oil companies are long-term planners, they look at projects over a long time, first oil could be here as late as 2017." The odds of the so-called Lower Churchill project going ahead are just as good now as they were before all this recession talk started. There's been no change. The odds are still zero. The creation of an energy corporation was a commitment in the 2003 election policy document, A Blue Print for the Future. The corporation was created by the Provincial Government in May 2007. It was also an integral component of the province’s Energy Plan: Focusing Our Energy, released in September 2007. You know what else was in said 2003 election policy document? This is one of those days where you really miss Bob Benson. And how much did that website, including the musical composition, cost, anyway? There still is a Speaker, right? MS PERRY: Mr. Speaker, there is no one I would rather have as the captain of my ship than our hon. Premier, Danny Williams. "The Human Rights Code is one of the most important pieces of the legislation we have in Newfoundland and Labrador," says Minister Marshall, in announcing a review of the Act. Derek Butler is a sessional lecturer in political science at Memorial University and was a director of the National Democratic Institute for International Affairs in Yemen and Morocco. He currently works for the Association of Seafood Producers. There are several other anachronisms in our modern democracy. We have appointed senators, for life. We have indirect election of the prime minister, who appoints a head of state. We have a first-past-the-post electoral system that generally affords parties more seats than their percentage of the vote might otherwise dictate, arguably to give us more accountability, while compromising the concept of representation. Speaking of anachronistic, that is a term that also describes Mr. Butler's knowledge of the Canadian political system. Senators haven't been appointed for life since the constitutional amendment of 1965. And the Prime Minister doesn't appoint the head of state, who is the Queen, not the Governor-General. Memo to self: do not get Poli Sci degree from MUN. Yet another curious synchronization error on the part of a Minister who has problems releasing government-commissioned reports on time. MR. PARSONS: On November 22, 2007, the media broke a story about certain reports done by that department concerning the future use of the Colonial Building. The report itself, apparently, cost $200,000 and it has still not been released by government. I ask the minister: When can we expect to see that report released? MR. JACKMAN: Indeed, the report is in its final stage. Second to that, and very much a part of, is federal funding. We are awaiting confirmation from the federal government as to whether they are going to support that project, and I anticipate that will be announced rather shortly - I mean, the overall report. MR. JACKMAN: That is what I just said. The report overall is in the stage of completion and will be submitted rather shortly. The report — remember, this is on April 16, 2008, was said to be "in its final stage", and "in the stage of completion". So why is it dated 2007? PREMIER WILLIAMS: He will do it right because we did it right and he can have our (inaudible) any day of the week. PREMIER WILLIAMS: The second piece of the Atlantic Gateway is we are trying to position ourselves as a North Atlantic Gateway, to open us up so that we can get up into the Northwest Passage, the arctic sovereignty issues, in order to service Greenland, Nunavut and Iqaluit, and also to position us from a Canadian perspective so that we are ideally positioned. That would include looking at upgrading the facilities in Happy Valley-Goose Bay and Argentia perhaps. St. Anthony would be another port that would be upgraded. That is part of it. Interestingly the provincial government only mentioned three specific revenue sources which are performing above budget estimates from last spring. Unmentioned was revenue from mineral revenues other than oil. Last year it was big enough to warrant a mention. This year: zip. Either mineral revenues are on par or down or the government is saving that for the spring to offset some bad news. So, how about it, Jerome!? "Let the people know the truth and the country is safe." MR. T. MARSHALL: I do not think the Opposition is ever interested in our answers but it is important that we get our answers out so that the people of Newfoundland and Labrador can know what our policy is and know what this government under Premier Williams has been doing to bring good government to the people of Newfoundland and Labrador, and that was certainly evident in the fiscal statement given by the hon. Minister of Finance today who brought down a - who indicated that the Budget for this year or the surplus projected for this year will be $1.27 billion. "We are spending as much as we can to stimulate the economy without overheating the economy, and making sure that we get the best bang for our buck, and we will continue to do so." That was Our Dear Premier, a week ago, speaking in the Bow-Wow Parliament. Along with the other three Atlantic Premiers, this week he wants Ottawa to stimulate his private sector. "This year I'm hoping that this report will now focus the attention of the people of this province finally on corrections, and that it's not something to be swept under the rug." That's hapless Justice Minister Tom Marshall, quoted in a report by the CBC. The same media report, in fact, which reveals the portions of the prison report said hapless Minister, umm, tried to sweep under the rug. Our province has a plan and, unlike some other jurisdictions, our plan is well underway. Mr. Minister, could you name some of these "other jurisdictions" that do not have plans that are underway? Follow-up, Mr. Minister, what is our "plan"? There are twelve references in Jerome! 's fiscal update to our "plan". Has anyone seen this "plan"? The incumbent will return from maternity leave in September 2008. The date, and the choice of verb tense, are the sorts of things you would write in a report in August 2008, or earlier. Yet the report — here's the link to the .pdf file — is forward-dated October 2008, a month after an event which is described, in the report, in the future tense. As Lincoln said, “Let the people know the truth and the country is safe”. That was Danny Williams-Government, in his Public Policy Forum speech, just nine months ago. Danny Williams-Government doesn't think you can handle the truth. The surveillance equipment at [the Labrador Correctional Centre] is outdated and does not serve the purpose for which it was designed. Throughout the interviews with staff, the Panel have repeatedly heard that staff are given inconsistent direction from the managerial level. Staff have described a dictatorship style of management in which they have little or no input into decision-making. Last year, this group,while training mostly on their own time, managed to participate competitively in the Regatta. The staff were proud of their accomplishments, but were disappointed that the Superintendent was not there to support them. Five days after the event an email was sent from the Superintendent's office congratulating the rowers. It makes a body wonder: is this sort of ham-fisted state control of the information flow the reason why Danny Williams-Government can't keep — or can't be bothered to keep — His 30-day guarantee? And it really makes a body wonder, just what else is He covering up? Iberville and Champlain both fall into the PQ column; the former quite decisively so. 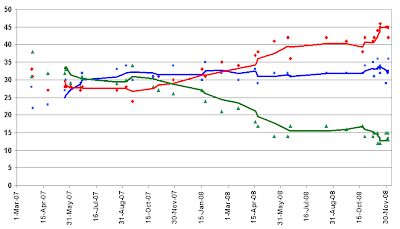 The road to a PQ majority government in 2012 (2010?) runs, at this hour, through Châteauguay, Drummond, Fabre, Îles-de-la-Madeleine, Laurier-Dorion, Laval-des-Rapides, Maskinongé, Mercier, Portneuf, Rouyn-Noranda—Témiscamingue, Saint-François, and Trois-Rivières. 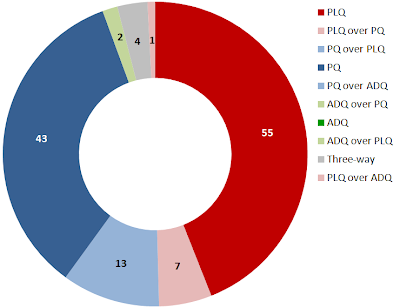 That's about a 3.5% conversion from PLQ to PQ... or less if the ADQ collapses to a singularity. 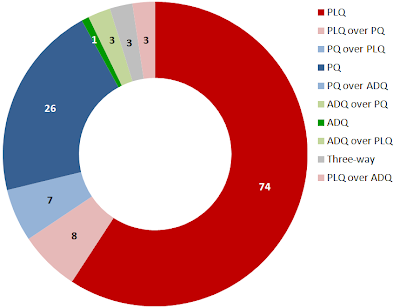 The net vote-shift from the ADQ seems to have been about 2:1 in favour of the PLQ vs. the PQ, but the PQ gained the larger chunk of the ADQ's former seats. Wow, Angus Reid nearly nailed it. In your face, Léger and CROP. Well, that was less exciting than the last time. 9:00 — Tale of the tape: The ADQ won 44% of the vote in the 41 ridings they won last spring. Tonight, they are at 27% in those same ridings. The PQ is leading in 19 of the 41, the PLQ in 16. Mario Dumont is clinging to 6. 9:02 — PLQ is ahead in the Maggies. 9:04 — The adéquiste is running third in 24 of the 41 ADQ-won ridings from 2007. 9:14 — Amir Khadr is holding to a narrow lead for Québec solidaire in Mercier, which is one riding over from Mulcair's federal NDP riding. Françoise David is trailing narrowly for QS in neighbouring Gouin. They are also on the board in Outremont, Laurier-Dorion, Sainte-Marie—Saint-Jacques, Hochelaga-Maissonneuve, and Rosemont. 9:14 — Chevarie is clinging to a narrow PLQ lead over the PQ down in the islands. 9:17 — How many guys are there named Jean-Yves Roy in politics down in the Matapedia-Matane area, anyway? 9:20 — Hey, CBC: the Lower North Shore polls always come in early. Lorraine Richard is racking up an absolute majority of the vote for the PQ in Duplessis, just like in the old days. Another election, and she'll be in Denis Perron country. 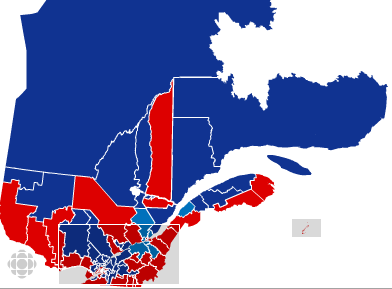 9:21 — Hmm... the electoral map at this hour, provincially, looks an awful lot like it did at this hour, federally, in November 2000. 9:36 — Well, crud; does this mean a spherical three-D vote model for the 2012 election? 9:39 — With a biggish number of polls still left to go in Dubuc, the PQ margin of lead is two votes. 9:44 — No huge surprise, but Maka Kotto's blue parachute has landed him safely in Bourget. 9:48 — The PQ owns Saguenay—Lac-Saint-Jean again. 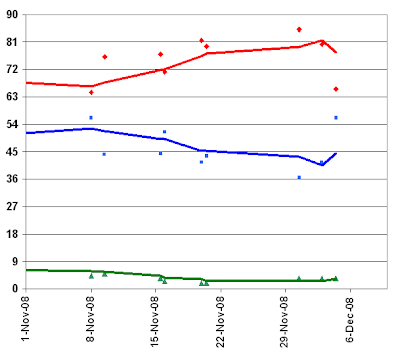 9:56 — In ridings that the ADQ won in 2007, the ADQ is down 17%, the PLQ up 10%, and the PQ up 7%. 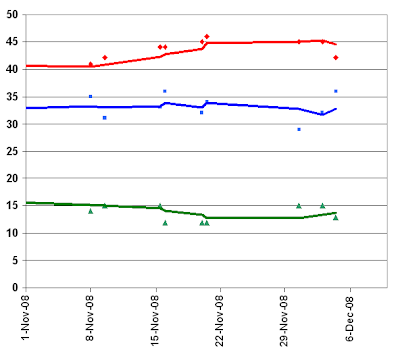 In ridings that the PQ won, the ADQ is down 14%, and the other parties are each up about 6%. 10:00 — PLQ pickups from the PQ: Les Iles, Gaspé, Rouyn-Noranda-Témiscamingue, Abitibi-Est. The eastern and western extremities of the province are redder than they have been in years. 10:03 — Bill Clennett is on the board in Hull for Québec solidaire. Without googling, who is Bill Clennett? 10:07 — Charest takes 58% in Sherbrooke to the PQ's 29%; slightly more comfortable than the 37%-33% margin last year. 10:11 — The ADQ's least worst showing is down in the Maggies, down from 5% to 1.5%, for a loss of "only" 3.5%. Next time... next time. 10:12 — Y'know, Charest is only a couple of by-elections away from losing that hard-earned second, non-consecutive, majority. 10:23 — The final tale of the tape: the Liberal vote share is up in 121 ridings, the PQ in 117, the ADQ in none. 11:04 — Dubuc ends up in the PLQ column by about two points. MR. KENNEDY: Mr. Speaker, I rise in this hon. House today to update residents of the Province on the progress of two new programs the Williams’ government announced earlier this year to assist families – the Progressive Family Growth Benefit and the Parental Support Benefit. Mr. Speaker, the Progressive Family Growth Benefit and the Parental Support Benefit add to the many family-focused supports that have been introduced or enhanced by the Williams’ government. The semi-literate Hansard editor, who doesn't know how to use an apostrophe, should never have had to consider the question of whether "Williams" takes one or not. There used to be a rule that you could not use the name of a member, even parenthetically, even in quoted material, during Parliamentary proceedings. The incumbent in the Speaker's chair has either forgotten that rule, or, more likely in the current atmosphere, never learned it in the first place. We're sorry. The report that we just "released" has been sent back to the censorship shop for re-censoring. We apologize for the inconvience. The latest, and presumably last, batch of polls are in on the provincial vote-intent question in Quebec, which goes to the "urns" tomorrow. Taken at face value — a dangerous game with three different firms, three different methods margins of error and all that; but hey, let's have fun — these figures might suggest a race that is narrowing significantly between the Charest Liberals and Marois Péquistes in its final hours. 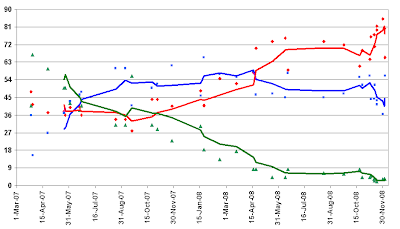 Indeed, the Angus Reid numbers put the PLQ on the edge of losing the majority, even the whopping majority, that has been within Charest's grasp for most of the year, and most of the campaign. They also suggest the ADQ on the edge of kablooieville, with most of the seats that Dumont won in 2007, tilting towards the Liberals in every election-period poll up until Angus Reid. 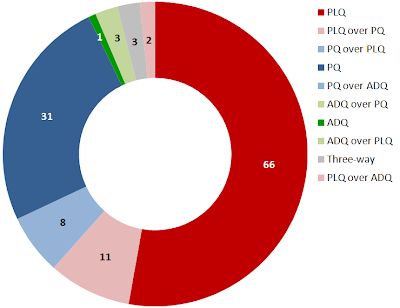 The Angus Reid poll would give the PLQ and PQ an almost even split of the ADQ's entrails, a scenario which looks an awful lot like Philippe Gohier's 50-50 split, except that the PQ can pick up more than half of the ADQ's seats by picking up less than half of the vote that the ADQ is bleeding... but the PLQ has to have a five or six point lead over the PQ in voter-pickups from the ADQ, if it is to split the difference in seats with the PQ. Charest still has the edge tonight, Election Eve... but by how much? And can Mario Dumont salvage enough seats to continue the minority status of the legislatur? Danny Williams-Government seems to have developed two clever new strategies to deal with that age-old question that has stumped provincial governments since 2003: how to avoid accusations that you are breaking your campaign promise to release government-commissioned reports within 30 days. Strategy one: be vague. On December 2nd, Danny Williams-Government released the Newfoundland Forest Sector Strategy Final Report, a report which is cleverly dated just "November, 2008". The thirty-day guarantee might have been, and quite probably was, met in this case, and woe be unto him who points out the mathematical possibility that it wasn't. Strategy two: front-date. The next day, Danny Williams-Government released the Report of the Taskforce on Adverse Health Events, which actually bears that date December 2nd. Yip. That's the date they printed on the report. Who knows; maybe that's the strategy that Danny Williams-Government will employ for the youth mental health report that DW-G has been sitting on for five full years now. But is she getting overtime? This government is going to ask responsibly, and we are stepping up. It just galls me to listen to the Leader of the Opposition talk about what this minister is not doing. She is working around the clock. She is meeting with everybody concerned. She is meeting with the corporations. Ask the people of Grand Falls what they think of what we have done on this particular issue with Abitibi. The union will tell you we were there for them, the community will tell you we were there for them, the members will tell you that we were there for them, everybody, and the company will tell you that we were there in discussions with them. You stand up and imply that we are just not doing anything. Nothing is further from the truth. This is not a Liberal Government, this is a PC Government. Umm, on a go-forward basis, right? Memo to the oppo: when you get responses like this out of him, you're hitting a seam of really good stuff. Mr. Speaker, the current Prime Minister, Prime Minister Harper, had indicated verbally that he would support a loan guarantee. Mr. Speaker, isn't it convenient that all kinds of things get said to the Premier all the time, verbally, behind closed doors, with no one else present? Why is the Premier now relying on his imaginary verbal committment, instead of on the imaginary written committment he imagined he had received in 2006? I would suggest, as a result of this accord, if you took the time to read it, you would realize that a new coalition government would support, in fact, clean energy and water, and that is what the Lower Churchill is all about. Mr. Speaker, the Premier seems to be suffering under the delusion — or the additional delusion — that the so-called Lower Churchill project is about clean water. Can he inform the House, what water will it clean? who will it supply clean water to? Our strategy on a go-forward basis would be to obtain the 8.5 per cent interest from Hibernia, it would be to obtain a loan guarantee from either the Harper government or a coalition government, and, in addition, it would be to obtain infrastructure funding – rapid infrastructure green funding – from a coalition government or a Harper government in order to help fund the Lower Churchill and/or a transmission line from the Lower Churchill to provide power to other areas. A follow-up question, Mr. Speaker: Which "other areas"? Does this mean that Our Dear Labrador Priority for infrastructure funding — going it alone with more money from Ottawa — is to find some way to get someone else to subsidize the extraction of yet another Labrador resource, on a go-forward basis, and its transmittal to "other areas", instead of, y'know, the Trans-Labrador Highway that was supposedly Our Dear Number One Project? Don’t try and compare us to what the Harper government has done in Ottawa. We have not done anything with regard to cutting off any political funding for your party. It is up to you to go out and raise whatever funds you want to go out and raise to support your party; it is a completely different issue. — ODP, in the Bow-Wow Parliament, Tuesday. Yesterday, this blogger suggested that three fine, upstanding PC MHAs were "fishing for an Award for Special Achievement in Sycophancy" in their fawning and almost embarrassingly ebuliant praise for Premier Williams. In fact, as it turns out, it is in fact RE/MAX which qualifies for this first irregular Award for Special Achievement in Sycophancy. Congratulations, RE/MAX! Yesterday's comments concerning the heartfelt and entirely not sycophantic comments by three PC MHAs, enabled by an unwitting Chair occupant, are withdrawn in their entirety, and apologies are issued, impersonally, to all who may have been offended or in any way harmed. St. John's is expected to lead the charge for residential real estate in Canada this year with an anticipated 11 per cent increase in unit sales. That's from RE/MAX which says this province is the only one expected to post a gain by year's end. Housing prices in St. John's are projected to climb by 21 per cent over last year. The sales of homes priced at a quarter million dollars or more is up some 78 per cent over last year's levels. RE/MAX says the Williams effect on the overall economy in this province is nothing short of remarkable. Next year, it's predicted that the number of homes changing hands will be down marginally but the average price is expected to continue climbing, rising 12 per cent to 202-thousand dollars. Mr. Speaker — or, in this case, Mr. Utterly Gormless Deputy Chair who was presiding at the time — don't you think, in the face of the numerous fawning, slack-jawed, star-struck MHAs who are fishing for an Award for Special Achievement in Sycophancy, that you actually start doing your job? The only place where the phrase "Premier Williams" ought to appear in Hansard is where it is inserted, in all-caps and bold face, by the Hansard editor, after you go home for the day. MR. HICKEY: Mr. Speaker, my colleague before me certainly stated a lot about the fact that our government, since 2003, has come into its own. It has come into its own because of the leadership of Premier Williams and the vision that he has for this Province and the vision that we, as a collective caucus and Cabinet, have to ensure that this Province is going to take the right path and to ensure that our children and our grandchildren have a firm footing for a solid future. We are going to see, and my hon. colleague alluded to it just before me - this year was a spectacular year - he mentioned the Hebron agreement. Again we talk about leadership, we talk about courage. If Premier Williams, with the support of our government, had not stood up to the big oil companies we would still be getting what we have gotten in the past, very little out of this resource. That is not what we did here, Mr. Speaker, and that is not what the Premier’s vision was here. His vision was to make sure that we get the maximum benefits for our resources. MR. DINN: I guess, the most galling example of this Province getting the dirty end of the stick was the 100-year Upper Churchill hydro deal that gives Quebec the lion’s share of the profits and to us only a few crumbs. Thank God these days are over! Premier Williams and his government, five years ago, embarked on a path of no-more giveaways, and recent deals and deals to be signed in the future under our watch will be signed only if this Province is the principle beneficiary. Mr. Speaker, in the past few months we have seen many countries in this world sink into economic decline. It could go from recession to depression. What caused this economic collapse? Most experts say that out of control government spending, uncontrolled debt load, high taxes and a lack of infrastructure spending are the leading causes of this economic meltdown. When Premier Williams and his government took control of this Province in 2003 they certainly found an environment that contained all of the elements that lead to recession. The Province had an operating deficit close to $1 billion. The debt per capita was the highest in the country and infrastructure spending was close to drying up. Roads, bridges and public buildings were in bad need of maintenance repair or replacement. The place was literally in a mess. MR. HEDDERSON: I can tell you, that time, those five years that I was in Opposition, were very, very lean times - coming in with district needs, roadwork up around $50 million, with regard to municipal infrastructure falling down around people’s ears, or with regard to our schools. I can tell you there were some bright spots, and I would be the first to admit there were some bright spots, but not enough of a light to shine to the path that we needed to get on. During those five years, I learned very, very quickly what the issues were, where we needed to go, but it was also during that time that we did have come on the political scene a leader who saw what was needed for the people of Newfoundland and Labrador to get to that point where they could say that they were independent, that they could say that we were getting the most value out of our resources, and that was in the person of our current Premier, Premier Williams. Premier Williams came on the scene and very quickly - and we look at him now as leading in government, but he led as well in Opposition. At that particular time he found ways in which to get things done, and clearly indicated to the people of Newfoundland and Labrador that he was prepared to lead and prepared to take them down a path, no matter what it cost him personally, to his party which he represented, but he was determined, and that determination today speaks loudly. As I look back on these last five years that the Williams’ government has taken over the reins in this particular Province, I can tell you that we have, as a government, moved this Province along. I would say to you that really I entered as an MHA as a have-not and I am very, very proud to stand here today and talk about being in a Province as a have-Province. People do not seem to understand how important that is to our future as much as it is to our present. I did not believe in my lifetime I would be standing anywhere, let alone the House of Assembly, and talking about a Province now that is in the category of the have in this country of Canada, I tell you, Mr. Speaker. Where does it go back to? It goes back to an Administration, to the Williams government, who, as a team – and I stress the word team, because when we first got in, we were on the ground running. We knew where we had to go. Natural Resources Minister Kathy Dunderdale says Wabush Mines is considering a significant cut in its production, and she says it will have an impact on employees. Dunderdale says Wabush Mines is meeting with its unions this afternoon. She says they'll have more information at the day goes on but the news isn't expected to be good. Dunderdale says it's the world we're living in. She says Newfoundland and Labrador is not separate from the world economic crisis. She says we have difficult times ahead, and there is no indication when things may settle down. Dunderdale says it's time for Ottawa to get involved. Something is happening which the provincial government would like federal money to fix. That means it's time for Ottawa to get involved. Sorry: That means it's time for Ottawa to get involved on a go-forward basis. Wait, wait, wait a minute. Hold on a sec. Since when are we supposed to care what the Globe and Mail has to say about anything? Since when does No Names Please care what the Globe and Mail has to say about anything? Will the Premier will be rooting for home-grown blogger Ed Hollett, and doing public GOTV exercises, following the precedent of home-grown Canadian Idol contestants? Who will give the Ministerial Statement? You'd almost think, given the startling paucity not just of Williams-Government press releases, but of press releases, period, that Danny Williams-Government isn't having nearly as much Premiery fun as he used to be. You'd really be inclined to think so when you consider that, at least at the start of the month, we were celebrating Our Dear Have Status and planning Our Dear Party for March 31st, 2009. And, when you consider that November is when CRA was in the field for its quarterly report, well, you'd pretty well clinch it. It was three weeks into November before Jerome Kennedy broke a 25-day scoring drought and put in a Williams-Government. It took almost another week for Dianne Whalen to match it. And that was it. It was the lowest-scoring month since May 2006, which was the last time that a month went by without any Danny Williams-Governmentiness at all. So, for the second time in five months, two ministers share the podium; and for the third time in seven months Dianne Whalen, this time along with Jerome Kennedy, earns the title Sycophant of the Month. Congratulations, Ministers!